The Canadian Psychological Asssociation is pleased to announce that it has a memorandum of understanding with four countries: Australia, Russia, South Africa, and the United States. Memorandum of Understanding between the Canadian Psychological Association and the Australian Psychological Society. Signatories: Dr. Martin Antony (CPA President) and Dr. Karen Cohen (CPA Executive Director on behalf of CPA) signed in Canadsa. Professor Bob Montgomery (APS President) and Professor Lyn Littlefield (Executive Director on behalf of APS) signed in Australia. 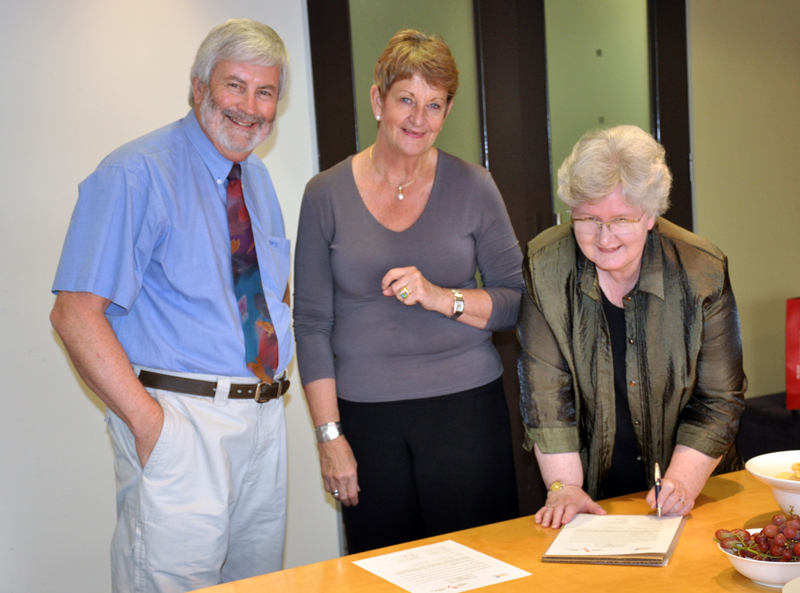 Australia’s Honorary Consul for Canada (Lois Appleby) was present at the signing in Australia (see photo – from left to right: Bob Montgomery, Lois Appleby, and Lyn Littlefield). Memorandum of Understanding between the Canadian Psychological Association and the Russian Psychological Society. Memorandum of Understanding between the Canadian Psychological Association and the Psychological Society of South Africa. Memorandum of Understanding between the Canadian Psychological Association and the American Psychological Association.